ELINT and SIGINT, or Electronic Intelligence and Signals Intelligence, involve monitoring the transmissions of the opposition, and studying the received signals to learn not only their message content, but also to learn the capabilities and limitations of the technology. For example, a major ELINT activity during the Cold War was to monitor Soviet missile tests, and try to determine the capabilities of the missiles, their payloads, and the radar systems used to track them. Some very important data is acquired by intercepting various radio signals related to a missile launch. These signals include rocket telemetry, radar pulses, and also the 'human' communications that may be discussing the launch. NEMS-Clarke was one of several companies that made telemetry and 'intercept' equipment for various government agencies. CIA documents from the 1950’s and 1960’s mention NEMS-Clarke models 167-J2, 1302A, 1306, 1501, 1702A, and 2801. In the intercept role, these receivers were used by CIA to monitor listening devices (‘bugs’), and in the R&D Lab to support the development of various surveillance devices. 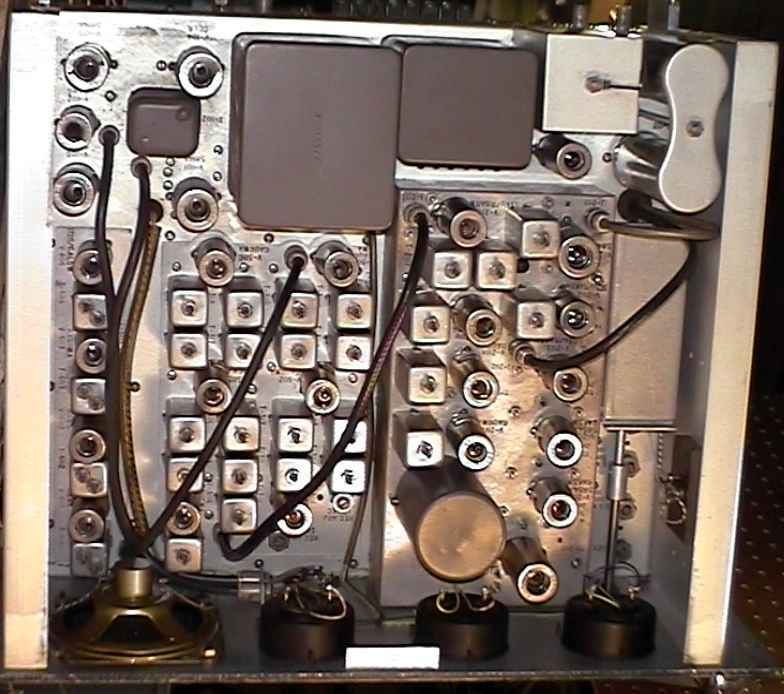 The model 1037 represents one of the last models from NEMS-Clarke before the Vitro Electronics telemetry receiver line was sold to DEI in the mid-1960’s. It was developed for the Mercury and Gemini space programs. The example shown here was made in 1965. The 1037 series (with letter suffixes from ‘A’ to ‘G’) supports plug-in modules for the front-end tuner and the discriminator. With various tuners, the frequency range is 55 to 2300 MC. The technology is a mix of Nuvistor tubes and transistors. Click HERE for a block diagram, and notes on the functionality of the rear-panel connectors. 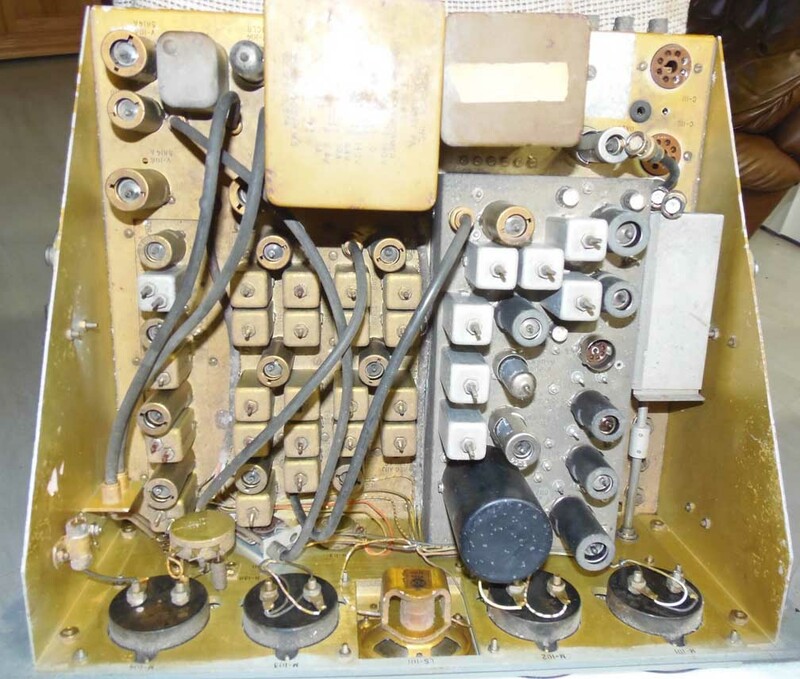 NEMS-Clarke 1037F-39 Multi-Range Telemetry Receiver. The blank panel in the upper-right is for an optional spectrum display unit. Author’s collection. · Tuning range: 215 to 245 MC on the model 1400. Later models in the series tune 215-260 MC. However, the tuning control on the 1400 has calibrations from 214 to 247 MC -- it is assumed that later models extended the range. There were a set of 44 standard crystal frequencies available from the manufacturer. This example includes a 43.8166 MC crystal, to operate the receiver on 232.9 MC. The large "Tuning" dial does not change the received frequency, but rather tunes the RF amp and mixer stages to match the frequency determined by the crystal. A second large knob, labeled "Freq", adjusts the second local oscillator (25 MC) over a range of +-150 KC. Using this control while observing the "Tuning" meter allows the user to directly measure the frequency of a signal that is not exactly on the expected frequency (temperature drift in a rocket telemetry system, for example). · Type of reception: PWM/FM, PTM/FM, FM/FM. Some models, such as the 1433, include phase-lock circuitry. · I.F. bandwidth: 100 KC or 500 KC (selectable). · I.F. frequencies: 30 MC and 5 MC. · First L.O. : crystal-controlled, using crystals in the 40 MC range, then multiplied by 6, for hi-side injection, creating a 30 MC I.F. · Second L.O. : 25 MC, tunable plus or minus 150 KC, lo-side injection, creating a 5 MC I.F. · Input/Output connectors: antenna input (50 ohms), pan-adapter output (30 MC), and video output. · Tube complement: 27 tubes, plus 5 germanium diodes. · Size: about 19 X 8-3/4 X 16 inches. · Weight: approx. 35 lbs. Similar 1400-series models include the 1403, 1412, 1432, and 1433. 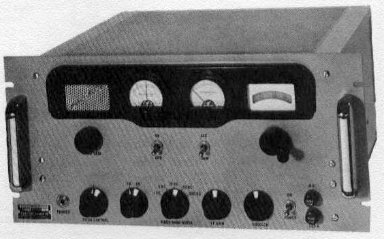 The NEMS-Clarke model 1400 Telemetry Receiver. The green object between the two large knobs is the crystal oven. Controls are, from left to right: audio gain, I.F. selector, deviation range select, 2nd L.O. frequency adjustment, and front-end tuning. The meters indicate frequency deviation, tuning, and signal strength. Author's collection. Two other models from the 1400 series - a model 1412 (left), and a model 1433. These models are seen in a 1961 catalog. NEMS-Clarke sold a transistorized VFO option, which plugs directly into the crystal socket, and mechanically gangs itself with the "Tuning" knob, allowing normal VFO operation from a single control. An example of the NEMS-Clarke 1500 series Surveillance Receivers. Models include the 1501, 1502, 1503, 1509, 1510, 1511, and 1512. Most models cover 55-260 MC, but some are 40-180 MC. This series is more general-purpose than the 1400 series - they receive AM, CW, and FM signals. The first I.F. is 21.4 MC, which makes them compatible with panoramic adapters used by other brands, such as CEI and Watkins-Johnson. Most models use a 6J4 as the RF front-end; but in some models the 6J4 is preceded by a 416B planar triode for better sensitivity. A model 1401. Images courtesy of Bill Wagner.